What Are Ticks? 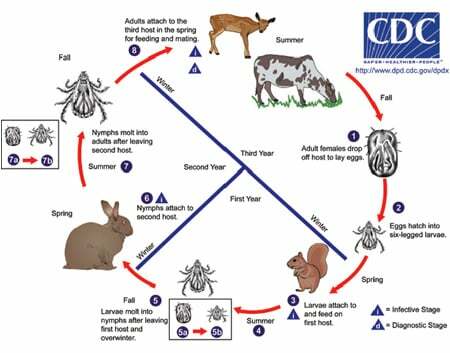 What Is the Life Cycle of a Tick? What Are the Different Types of Tick-Borne Illnesses? What Are Tick Bite Risk Factors? What Specialties of Doctors Treat Tick Bites? What Are Signs and Symptoms of a Tick Bite? When Should Someone Seek Medical Care for a Tick Bite? How Do Doctors Diagnose a Tick Bite? Are There Home Remedies for a Tick Bite? What Are Tick Removal Methods? What Is the Treatment for a Tick Bite? Is It Possible to Prevent Tick Bites? What Is the Prognosis for a Tick Bite? Ticks are small bloodsucking arthropods. They are classified in two families, Ixodidae (hard ticks) and Argasidae (soft ticks), each containing different genera and species of ticks. Ticks are the leading carriers of vector-borne diseases to humans in the United States, second only to mosquitoes worldwide. In most circumstances, it is not the tick bite but the toxins, secretions, or organisms in the tick's saliva transmitted through the bite that cause disease. Ticks (and mites) are arthropods, like spiders; all three belong to class Arachnida. There are more than 800 species of ticks throughout the world. Many organisms that bite humans for a blood meal are not ticks and should not be confused with ticks. Some common examples are mosquitoes, bedbugs and fleas (these are insects, not arthropods). If it is possible to bring into the doctor's office what has caused a "bite," the physician may be able to determine what potential vector caused the "bite." Two families of ticks, Ixodidae (hard ticks) and Argasidae (soft ticks), are important to humans because of the diseases or illnesses they can transmit or cause. Hard ticks have a tough back plate or scutum that defines their appearance. The hard ticks tend to attach and feed for hours to days. Disease transmission usually occurs near the end of a meal, as the tick becomes full of blood. Figure 1 shows several hard ticks and the various stages in their life cycle. The stages are part of the life cycle of ticks; the smallest stages, larva and nymph, are sometimes generally referred to as "seed ticks" because they resemble small plant seeds. Soft ticks have more rounded bodies and do not have the hard scutum found in hard ticks. These ticks usually feed for less than one hour. Disease transmission from these ticks can occur in less than a minute. The bite of some of these ticks produces intensely painful reactions. Ticks can transmit disease to many hosts; some diseases cause economic harm such as Texas fever (bovine babesiosis) in cattle that can kill up to 90% of yearling cows. Figure 2 shows the body of a soft tick; there is no hard scutum, only the soft body. 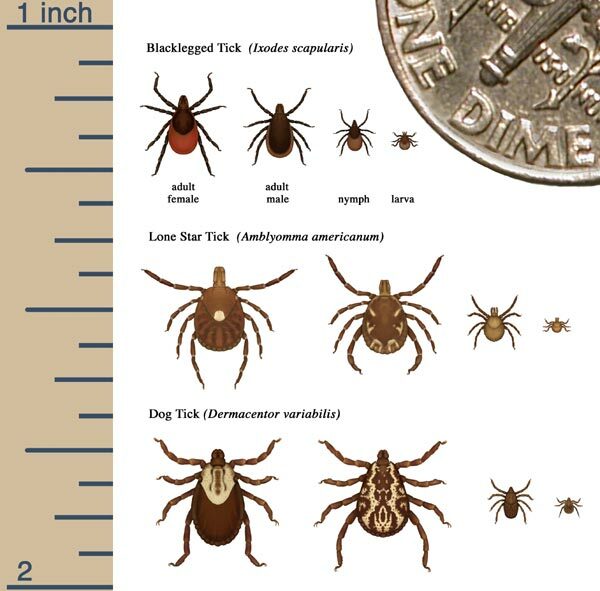 The adult soft ticks are about the same size as adult hard ticks (see Figures 1 and 2). Southern tick-associated rash illness (STARI) -- Amblyomma americanum or lone star tick (hard tick) -- infectious agent not yet identified according to U.S. Centers for Disease Control and Prevention (CDC); some researchers suggest Borrelia lonestari may be the infectious agent. 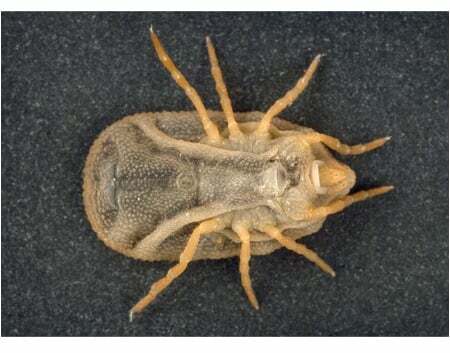 Heartland viral disease -- Amblyomma americanum or lone star tick (hard tick) -- new viral disease discovered in 2012 in South/Central U.S.
Outbreaks of tick-related illnesses follow seasonal patterns (about April to September in the U.S.) as ticks evolve from larvae to adults. Mild winters with an early spring often result in a high number of ticks and an increased frequency of the diseases they transmit. Different ticks go through complex life cycles (for example, see Figure 3) that involve mating and larval formation and usually have several hosts; humans are usually not an essential part of the normal tick life cycle, but wherever a mammalian host is pictured in a tick life cycle, usually a human can replace the normal host animal. For example, in Figure 3, people could replace the deer or cow. However, in most cases, the life cycle is not completed with human hosts. Also, it is possible that more than one pathogen may pass to a human from one tick bite (for example, Lyme disease and babesiosis). In addition to the diseases listed above, tick bites may cause a person to develop an allergic reaction to eating red meat (for example, beef, pork, or other meats). Unfortunately, the CDC in 2018 indicates that the number of reported individuals with tickborne disease doubled in the last 13 years with Lyme disease accounting for 82% of reported cases. However, the CDC reports about 30,000 cases of Lyme disease infections per year but estimates the true incidence is approximately 10 times greater. Ticks live and hide in low brush; this location allows them to physically contact a host. One study suggested that leaning against a tree or sitting on an old log was the quickest way to acquire ticks (about 30 seconds) in tick-infested areas. Ticks require a "blood meal" to grow and survive, and they are not very particular about on whom or what they feed. If ticks don't find a host, they may die. Often the tick secretes "cementum" to more firmly attach its mouthparts and head to the host. Ticks may secrete or regurgitate small amounts of saliva that contain neurotoxins. These nerve poisons cleverly prevent the host from feeling the pain and irritation of the bite. Consequently, individuals may never notice the tick bite or its feeding. The saliva may contain a blood thinner to make it easier for the tick to engorge itself with blood. Some people are allergic to these secretions and may have a quick and severe allergic reaction to a tick bite; a few may develop other symptoms listed below. Risk factors for tick bites include hiking in woods and/or grasses with skin exposed to the environment, especially from the months of April through September, and not using insect repellent or clothing that protects the arms, legs, and other body areas. People who have pets that are not protected by flea and tick repellents may also be at increased risk. Most tick bites require no treatment, but occasionally specialists in infectious disease, allergy, internal medicine, and doctors especially trained in treating tick-related diseases (such as Lyme disease) may be consulted to help diagnose and treat certain individuals. Tick bites are generally painless. Many people may not even notice the bite and may never find the tick if it falls off. Small ticks, like the deer tick that transmits Lyme disease, are so tiny they may be nearly undetectable. Some nymphal ticks are about as small as the period at the end of this sentence. However, there are some symptoms that may occur that can be directly related to the tick itself; they are due to the tick bite. Occasionally, a neurotoxin (a substance that is toxic to nerves) secreted at the time of attachment to make the bite unnoticeable to humans and other hosts can cause muscle weakness or paralysis. It rarely causes paralysis that inhibits breathing or may cause neck stiffness. The simple task of removing the tick stops any further neurotoxin production, and the person usually recovers quickly and completely. The actual bite may cause symptoms only after the tick drops off. However, some people may notice local redness (red spot), rash near the bite, itching, burning, and rarely, localized intense pain (soft ticks) before or after the tick drops off. The majority of tick bites result in few, if any, immediate symptoms. However, saliva from the Lone star tick has been linked to allergic reactions to red meats (beef, pork, venison, for example). Milk allergy may also occur. Researchers suggest an alpha-gal sugar antigen is secreted with tick saliva into humans that produce an immune response to similar antigens in red meats. When red meats are eaten, the immune system responds by causing swelling, hives, and even anaphylactic shock. Occasionally, the tick bite may become infected, causing localized swelling, swollen lymph nodes, and/or red streaks to appear in the skin. The results of the illnesses or pathogens transmitted by ticks often begin days to weeks after the tick is gone. That's why doctors or affected individuals may not suspect a tick-related illness because many people are not aware of the bites or ignore or forget about barely noticeable "bites." The most important clue about any tick-related illness is to tell the physician about a tick bite. Also, the individual needs to tell their physician about outdoor activity (camping, hiking, etc.) in tick-infested areas even if the person does not remember a tick bite. These symptoms may appear with many different types of tick bites; the symptoms that develop due to the different organisms are included in this list, but readers are advised to use the links provided in this article for more information about specific conditions. This will allow the reader to obtain a more definitive set of symptoms for each different pathogen passed into the host by ticks. 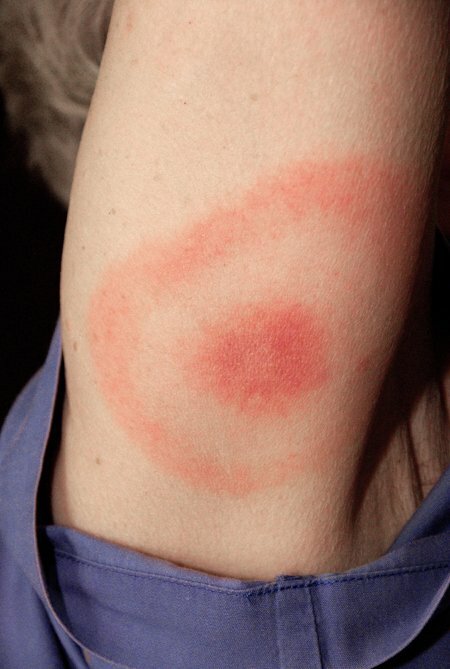 For example, Figure 4 shows the "bull's eye" rash seen in patients who develop Lyme disease. The person or child bitten by a tick exhibits any weakness, paralysis, lethargy, confusion, fever, numbness, headache, or rashes. The tick cannot be removed from the skin, or the head and mouthparts remain in the skin after removal. Symptoms listed above persist or get worse. Pregnant women should inform their doctors of tick bites and particularly before they take any medications. Immunosuppressed individuals (for example those with HIV or cancer or who are receiving cancer chemotherapy) should inform their physicians of tick bites. examination of blood under a microscope is necessary to diagnose the parasite that causes Babesiosis. Knowledge of the type of tick that caused the bite can help narrow the physician's list of possible diagnoses and even allow the physician to proceed with early therapy before a positive diagnosis is made. 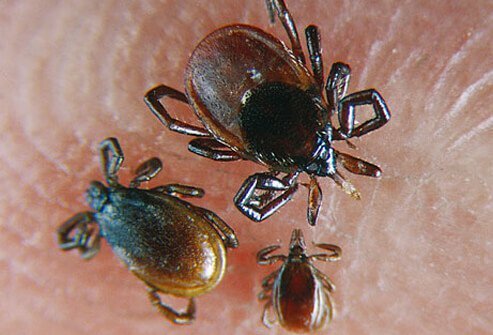 Exams and tests should be done if an individual exhibits symptoms after a tick bite; most tick bites do not result in symptoms. If symptoms develop after a tick bite, the determination of which tests need to be performed is best done in consultation with an infectious-disease specialist. Unfortunately, many people think they know how to remove ticks, but most common tick-removal methods result in increasing the chances of infection. The greatest concern in removing a tick is the possible transmission of disease. Methods of removal that stimulate the tick to spit out even small amounts of their blood meal, or to pass infected saliva back into the host, may increase the likelihood of disease transmission. Commonly used methods such as a hot match head touched to the hind parts of the tick, to covering or "painting" the tick with paint, nail polish, petroleum jelly, or gasoline, may cause additional injury to the host (humans, dogs, cats) as well as to stimulate the tick to produce more pathogen-containing secretions that enter into the bite site. All of the head and mouthparts of the tick should be removed. Because the tick is attached firmly to most hosts, rough or improper handling may result in portions of the head and mouthparts remaining embedded in the skin. This can be a site of infection and inflammation and might increase the likelihood of transmitting disease. Use a small pair of curved forceps or fine-tipped tweezers. Wear some sort of hand protection, such as gloves, so you don't spread pathogens from the tick to your hands. Using the tweezers, carefully flip the tick over onto its back. Grasp the tick firmly with the tweezers as close to the skin as possible. Apply gentle pulling until the tick comes free. Twisting or turning the tick does not make removal easier because the mouthparts are barbed; in fact, such actions may break off the head and mouthparts, thereby increasing the chances for infection. The illustration below from the U.S. CDC (Figure 5) shows the proper technique for removal of a tick. Once removed, don't crush the tick because you may transmit disease. Rinse it down a sink or flush it down a toilet. Consider keeping it in a tightly closed jar or taped to a piece of paper. Show the tick to the doctor if you become ill from the tick bite. The area of the bite should leave a small crater or indentation where the head and mouthparts were embedded. If portions of the head or mouthparts remain, they should be removed by a doctor. Thoroughly cleanse the bite area with soap and water or a mild disinfectant. Observe the area for several days for development of a reaction to the bite, such as a rash or signs of infection. Apply first-aid antibiotic cream to the area. Application of an antibiotic to the area may help prevent a local infection but usually does not affect the chance of developing diseases transmitted by the tick. Remember to wash hands thoroughly after handling any tick or instruments that touched a tick. Clean and disinfect any instruments that were used. Find the tick on the skin, and with your finger (preferably a gloved finger), rotate the body of the tick clockwise or counterclockwise for about a minute or so. This motion irritates the tick enough to cause it to let go of the skin; then the tick can be removed by simply touching the tick to a piece of scotch tape. Put liquid soap on a cotton ball and cover the tick with the soaked cotton ball for about 15 to 20 seconds; the tick will release itself from the skin and get caught up in the cotton ball that can be discarded in a sealed plastic bag. These methods are mentioned because sometimes tweezers are not available. So, if these methods remove the tick along with its intact mouthparts, individuals should thoroughly wash their hands and disinfect any areas the tick may have come in contact with. Local cleansing and antibiotic cream may be applied. For itching, the doctor may recommend preparations containing diphenhydramine (Benadryl). Benadryl compounds can be applied directly to the skin for itching or administered orally by tablets. Oral antibiotics may be prescribed for some diseases. With more significant symptoms, you may need antibiotics given through an IV and may need to be hospitalized. Other treatments may involve more detailed blood tests, fluids and medications given by IV, and admission to the hospital. For detailed explanations of treatments, the best approach is to determine the diagnosis of the disease transmitted by the tick bite (for example, Rocky Mountain spotted fever, Lyme disease) and then examine the specific treatments used for that disease. Avoid shrubs and areas with tall grasses where ticks may be lying in wait to tag a ride on a potential "meal." Apply insect repellent, specifically the brands designed to repel ticks. Follow label instructions. Avoid use of DEET-containing repellents on children. Carefully follow instructions and apply some repellents directly to skin and others to clothing. In areas with a high concentration of ticks, DEET-containing repellents may need to be reapplied more frequently than for repelling mosquitoes. Follow the package label instructions carefully. Promptly check yourself, others, and pets if exposed to tick areas. Make sure to treat pets with flea and tick repellents. If ticks are removed from pets, manage them the same way you would remove a tick on a person. Protect yourself from the potential exposures with gloves. In 2010, the U.S. EPA began warning pet owners about the toxicity of these repellents for house pets. A number of small pets have died as a result of overexposure to these tick and flea repellents. People who want to use these repellents should consult their veterinarian before use to be sure they will not harm the pet. People who live in a tick-infested area and have experienced a fever within the last two months should not donate blood. Taking antibiotics for the prevention of Lyme disease is controversial and probably only useful in areas of the country where exposure to deer ticks would be high. There is no vaccine against ticks, but ongoing research suggests that a type of white blood cell (basophils) may play a role in resistance to tick bites. Area-wide application of acarnicides (chemicals that will kill ticks and mites) and reduction of tick habitats (for example, leaf, litter, and brush removal) have been effective in small-scale trials. New methods of control include applying acarnicides to animal hosts by using baited tubes, boxes, and feeding stations in areas where infected ticks are endemic (for example, some areas in Texas). Biological control with fungi, parasitic nematodes, and parasitic wasps may help reduce the tick population. Some scientists are using satellite imagery to predict where heavy infestations of ticks are likely to occur so people may be forewarned. Most tick bites are probably harmless and may cause no problems. Ticks that have never fed, if handled properly, will not cause any harm. The earlier a tick is removed, the less the likelihood that the tick transmitted any disease. If there is any immediate reaction to a tick bite and if the tick is removed quickly, most individuals recover almost immediately. The outlook (prognosis) of the diseases transmitted by tick bites can range from good to poor; once a diagnosis is made, the prognosis is best determined by the diagnosing physician and is related to the disease that was transmitted by the tick and the stage of development of the disease process in the individual at the time of diagnosis and treatment. Avoid prolonged contact with wood as well as with leaf-litter areas. Inspect yourself carefully after spending time in tick-infested areas. What was your experience with ticks? How do you prevent ticks from getting on your dog? What treatment have you received for tick bites?